Fifteen-year-old New Yorker Daisy thinks she knows all about love. Her mother died giving birth to her, and now her dad has sent her away for the summer, to live in the English countryside with cousins she’s never even met. Winner, Guardian Children’s Fiction Prize. Meg was born in Boston, USA but now lives in Highbury, London with her husband, the painter Paul Hamlyn, and their daughter Gloria. 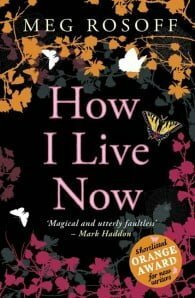 How I Live Now was Meg Rosoff's debut novel, which won the Guardian and Branford Boase Awards and was short-listed for the Orange Prize for New Fiction as well as the Whitbread. It garnered the sort of rave acclaim most writers only ever dream of. Since How I Live Now, Meg has gone on to write several award-winning books for teenagers including Just in Case, What I Was and The Bride's Farewell. She has also written Jumpy Jack and Googily, Meet Wild Boars and Wild Boars Cook for very young children.